Some people appear to be cursed. Seriously, there are certain poor souls out there who have nothing but tragedy after tragedy in their lives. It never stops! It is like they have a dark cloud hanging over their heads. It is like the Universe is out to get them. You would think that life would lighten up on them, but it doesn’t. You may be one of these people. If you are, then you know that bad luck is real. You get the shaft no matter what you do. Many people don’t want to believe this. They’ll blame everything BUT bad luck. They even try to blame the poor victims who suffer from it. These nasty people will try to say that those who have bad luck somehow caused it themselves! Have you ever had something awful happen to you, and then someone tries to blame you for it? Then you know what I am talking about. There are situations where completely innocent people have bad things rain down on them for no reason. They don’t cause it. They don’t make bad choices. It is just bad luck. People who dismiss this usually have never gone through a string of really rotten luck. They don’t know what they are talking about. Really, they don’t want to admit that bad luck is real because if they do, that means it can happen to them! Instead they want to believe that bad things happen for a reason. They want to believe that people who have bad luck did something wrong. They want to think that if bad things happen, then it is just coincidence. That way they can think that bad luck won’t come calling for them. Wrong! Bad luck’s fingers can reach out for anyone. It is almost like a force that goes searching for people. And when it finds its poor targets, then they truly suffer. There are a lot of things in this world that we don’t understand. Luck, whether good or bad, is real. If you have bad luck, then I have hope for you. For many, rotten luck does seem to let go after a while. I know people who have had bad luck most of their lives. But then all of a sudden, something changes. And when that change happens, better luck takes hold. While you can’t really change your luck, you can increase your chances of having better outcomes. Sometimes you can use your mental and physical energy to impact your environment. Because we are made up of energy, if you visualize being strong, then it can help you better cope with what is happening to you. And when you feel a little better, you are able to do more which can increase your chances of getting what you want. When this happens, your energy can change. This can give you a better chance. I’m not saying that this is easy. If you’ve gone through a lot of bad things, then trying to force yourself to feel positive is not going to magically make things right. But you can center yourself and focus on being strong. This lets people know you will not put up with crap. This can be a first step to taking more control of your life. It can increase your chances of having better luck. Hold on if you are going through a rough patch. Although luck plays favorites, you will have times in your life when your luck changes. Bad luck eventually does go away. You just have to wait it out and know that better things will come. 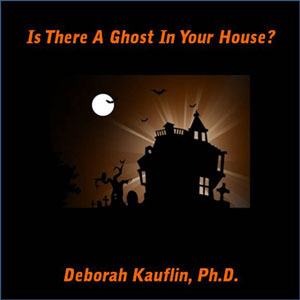 This entry was posted in Paranormal and tagged bad luck, deborah kauflin, ghost, grief, paranormal, supernatural on March 26, 2014 by spiritdeb. Having interviewed twenty five serial killers, Dr. Kauflin created profiles of female serial killers which she wrote about in her first book The New Predator: Women Who Kill, Profiles of Female Serial Killers (2000). She also created new profiles of sadists in her second book Vulture: Profiling Sadistic Serial Killers (2005). Finally, in her third book Disturbed: Terrorist Behavioral Profiles (2008) Dr. Kauflin predicted the Mumbai India terror attacks which took place two weeks after she released the book. She has written for the magazine Psychology Today for the last three years and is currently working on more paranormal books. She has appeared as an expert on the Discovery Channel, ABC, CNN, FoxNews, Investigation Discovery, and many other media programs. I will be making this ebook available for download here on my wordpress blog for only $.99 this year. Watch for it! This entry was posted in Paranormal, Uncategorized and tagged deborah kauflin, demon, ghost, haunting, paranormal, supernatural on March 22, 2014 by spiritdeb.